Spc. Ryan Gere, a motor transport operator assigned to the 24th Composite Truck Company, Heavy and 526th Quartermaster Composite Supply Company, 541st Combat Sustainment Support Battalion, 1st Infantry Division Sustainment Brigade, inspects his weapon system attached to a Humvee prior to rolling out on a tactical convoy mission May 11 at Fort Riley. Gere is one of many Soldiers participating in supporting the 1st Armored Brigade Combat Team, 1st Infantry Division’s Danger Focus training exercise. Soldiers assigned to the 24th Composite Truck Company, Heavy and 526th Quartermaster Composite Supply Company, 541st Combat Sustainment Support Battalion, 1st Infantry Division Sustainment Brigade, conducted daily logistics package missions from May 1 through May 17 at Fort Riley. The purpose was to resupply the 1st Armored Brigade Combat Team’s Danger Focus training exercise. Danger Focus is a validation exercise in which the division ensures the brigade is prepared for deployment. 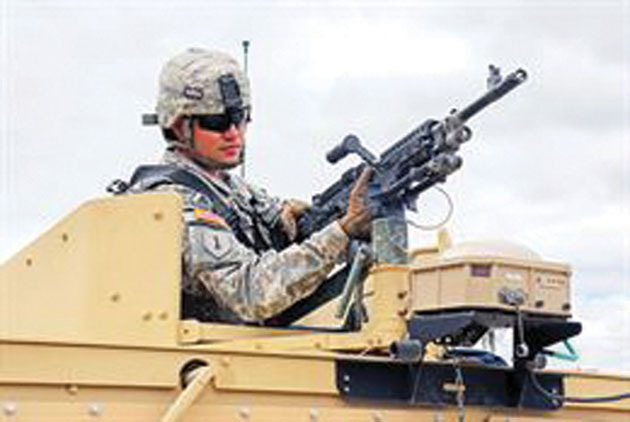 “The convoys gave the Soldiers valuable training and experience in a real-world situation,” said Staff Sgt. Quincy Lawery, a squad leader from Montgomery, Alabama, assigned to 24th CTC. 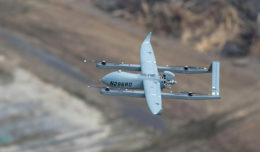 The 24th CTC and 526th CSC worked equally to support the “Devil” brigade’s exercise, and their Soldiers will train together soon at the National Training Center in Fort Irwin, California. Each company teams up every day of the week to transport necessities such as food, water, fuel and barrier materials to the Soldiers out in the field. First Lt. Alexander Besancon, a platoon leader within the 24th CTC, had positive comments about working with a fellow company in the brigade during the high-profile exercise. 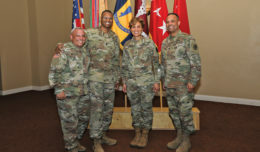 During the NTC rotation, the “Truckmasters” company will be attached to 375th Combat Sustainment Support Battalion, a Reserve unit out of Mobile, Alabama, where its Soldiers will be responsible for establishing a logistics support area and supporting the brigade with various classes of supply. “I’m excited to go to NTC because I will get a feel of what to expect if I was to deploy,” said Spc. Dwayne T. Powell, a motor transport operator from Fort Worth, Texas, assigned to 24th CTC. While taking advantage of conducting tactical convoy operations in support of the Devil brigade’s upcoming NTC rotation, 24th CTC Soldiers are also preparing themselves for their own field exercise. They conducted many training events, such as reacting to direct fire, vehicle recovery and reacting to improvised explosive devices. 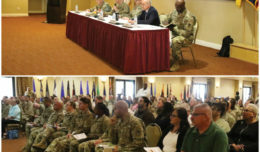 “Supporting 1st ABCT and conducting tactical convoys gave the Soldiers and leaders a chance to gauge our proficiency and identify areas that need improvement so our field exercise will be a success,” Lawery said.